If you want to download udemy videos but do not know how to, then this is the article for you. In this article, we will teach you how to download udemy videos easily with Bigasoft Video Downloader Pro for Mac. I guess, you must be fond of learning. So, you want to equip yourself with knowledge, you registered on www. udemy. com or www.lynda.com or other study websites. However even after payment, you find frustratingly that these study websites do not support downloading and the videos you've already purchased do not seem like something that belongs to you, right? I mean, if we bought something, we sure want to have it whenever we want. And in this case, we sure want to watch the videos we bought any time we want to, be it with or without wifi. Yet, they failed you. What do we want to do? Yes, we want to download the videos. But how? Bigasoft Video Downloader Pro is here to help. Why do We Choose Bigasoft Video Downloader Pro to Download Udemy Videos? First, it is powerful. It can download the udemy videos successfully and fast for you. Actually, not only for udemy videos, it can also download videos from many other websites, such as Lynda, tv.com or MySpace, Crunchyroll, BBC, Discovery, NBC, Youtube, or Dailymotion, Vimeo, Goear music, Metacafe, Break, Veoh, Ted Talk..
Second, it is an all-in-one downloader. If the downloaded video are not supported by your player, you can even convert the downloaded file into any formats such as MP4, AVI, FLV, MKV with it to make sure that they can be fluently enjoyed on Windows, Mac, iTunes, QuickTime, Apple TV, iPad, iPod, iPhone, Kindle Fire, Android and more. Third, it is easy to use. You can download video with only three steps. Also, you can do batch downloading. How to Download Udemy Videos with Bigasoft Vdieo Downloader Pro? 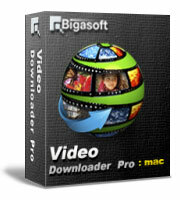 First , let's download and launch Bigasoft Video Downloader Pro for Mac to make preparation works. Second, three steps to download RTMP videos with Bigasoft Video Downloader Pro. Step 1 Add the URL of the udemy video you want to download. Step 2 Copy the URL of the video and paste into Paste UR Click Download button L.
Bigasoft Video Downloader Pro is the best way to download udemy videos. It can download videos from Youtube, Hulu, CBS, and convert video from almost all popular video sites like YouTube, Dailymotion, Vimeo, Goear music, Metacafe, Break, Veoh, BBC, etc to helps us easily enjoy online video on Mac, iTunes, QuickTime, Apple TV, iPad, iPod, iPhone, Kindle Fire, Android and more.